Hurricane Irma rolled through the Southeast and impacted many sectors of the region’s agriculture. While growers continue to assess the damage on their farms, Ayanava Majumdar, Extension entomologist for the Alabama Cooperative Extension System, reminds them to check their crop for unusual pests as well. According to Majumdar, insects generally do not like wet weather. Rain can bring insect pathogens and cause the pests to be dislodged from the plant, making them vulnerable to predators on the ground. Hurricanes, however, cause even more issues for the insects and the growers. Majumdar says growers can expect some of the same occurrences as with a bad storm. Large insects, such as butterflies, will have a high mortality rate, and smaller insects, such as aphids, will be dislodged from plants. 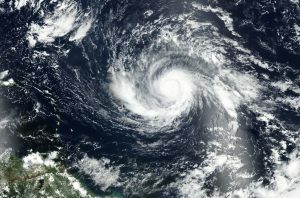 Strong hurricane winds cause additional problems. Majumdar says regarding smaller insects, the wind will not only dislodge them from the plant, but it will move them “far and wide.” Growers are at risk of finding unusual pests in their production systems after a hurricane. For growers who were impacted by Hurricane Irma, Majumdar gives some suggestions. He recommends that growers closely scout their crops for any unusual visitors as they assess the damage. Then, wait for better weather to treat the crop. As always, Majumdar also highly recommends keeping in touch with a local Extension agent. Majumdar reminds growers to take pictures of any questionable insects to show an Extension agent. This way, they can receive the best course of action for treatment.